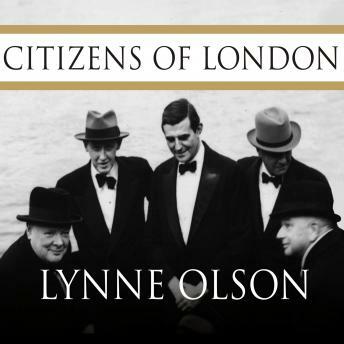 In Citizens of London, Lynne Olson has written a work of World War II history even more relevant and revealing than her acclaimed Troublesome Young Men. Here is the behind-the-scenes story of how the United States forged its wartime alliance with Britain, told from the perspective of three key American players in London: Edward R. Murrow, Averell Harriman, and John Gilbert Winant. Drawing from a variety of primary sources, Olson skillfully depicts the dramatic personal journeys of these men who, determined to save Britain from Hitler, helped convince a cautious Franklin Roosevelt and a reluctant American public to support the British at a critical time. The three-Murrow, the handsome, chain-smoking head of CBS News in Europe; Harriman, the hard-driving millionaire who ran FDR's Lend-Lease program in London; and Winant, the shy, idealistic U.S. ambassador to Britain-formed close ties with Winston Churchill and were drawn into Churchill's official and personal circles. So intense were their relationships with the Churchills that they all became romantically involved with members of the prime minister's family: Harriman and Murrow with Churchill's daughter-in-law, Pamela, and Winant with his favorite daughter, Sarah. Others were honorary 'citizens of London' as well, including the gregarious, fiercely ambitious Dwight D. Eisenhower, an obscure general who, as the first commander of American forces in Britain, was determined to do everything in his power to make the alliance a success, and Tommy Hitchcock, a world-famous polo player and World War I fighter pilot who helped save the Allies' bombing campaign against Germany. Citizens of London, however, is more than just the story of these Americans and the world leaders they aided and influenced. It's an engrossing account of the transformative power of personal diplomacy and, above all, a rich, panoramic tale of two cities: Washington, D.C., a lazy Southern town slowly growing into a hub of international power, and London, a class-conscious capital transformed by the Blitz into a model of stoic grace under violent pressure and deprivation. Deeply human, brilliantly researched, and beautifully written, Citizens of London is a new triumph from an author swiftly becoming one of the finest in her field.